“The Next Age of Invention: Technology’s future is brighter than pessimists allow.” in Brian C. Anderson ed., City Journal, Manhattan Institute, Winter 2014, pp. 14-20. “Big Ideas – Riding the Technology Dragon” in Milken Institute Review, Milken Institute, Second Quarter 2014, pp. 8-94. “The History of Technological Anxiety and the Future of Economic Growth: Is This Time Different?” in Journal of Economic Perspectives, Joel Mokyr, Chris Vickers, and Nicolas L. Ziebarth, Vol. 29, No. 3, Summer 2015, pp. 31-50. “The Real Future of Capitalism/Capitalism Reinvents Itself” in Current History, History of Capitalism, Vol. 112, Issue 757, 2013, pp. 291-297. “Secular Stagnation: Facts, Causes, and Cures” in Coen Teulings and Richard Baldwin, eds., a VoxEU.org eBook, London: CEPR Press, 2014, pp. 83-89. “Institutions, Property Rights, and Economic Growth” in Sebastian Galliani and Itai Sened, eds., The Legacy of Douglass North, Cambridge: The Cambridge University Press, 2013, pp. 8-42. “The Economics of Being Jewish” in Critical Review, Vol 23, Issue 1-2, March 2011, pp. 195-206. “Cultural entrepreneurs and the origins of modern economic growth” in Scandinavian Economic History Review, Scandinavian Society for Economic and Social History, Vol 61, No. 1, 2013,pp. 1-33. “Understanding growth in Europe, 1700-1870: theory and evidence” in Stephen Broadberry and Kevin H. O’Rourke, eds., The Cambridge Economic History of Modern Europe – Vol I, 1700-1870, Cambridge: Cambridge University Press, 2010, pp. 7-42. “The Contribution of Economic History to the Study of Innovation and Technical Change: 1750-1914” in Bronwyn H. Halland and Nathan Rosenberg, eds., Handbook of the Economics of Innovation – Vol I, Burlington: Academic Press, 2010, pp. 11-50. “The Rate and Direction of Invention in the British Industrial Revolution: Incentives and Institutions” NBER Working Paper Series 16993, Ralf Meisenzahl and Joel Mokyr, April 2011. “Natural History and Economic History: Is Technological Change an Evolutionary Process?” Draft lecture, Jerusalem, April 2000. “The Political Economy of Technological Change: Resistance and Innovation in Economic history” in Maxine Bergand Kristin Bruland, eds., Technological Revolutions in Europe, Cheltenham: Edward Elgar Publishers, 1998, pp. 39-64. “Innovation and Selection in Evolutionary Models of Technology: Some Definitional Issues” in John Ziman, ed., Technological Innovation as an Evolutionary Process, Cambridge: Cambridge University Press, forthcoming 1999. “Innovation and Its Enemies: The Economic and Political Roots of Technological Inertia” in MancurOlson and Satu Kähkönen, eds., A Not so Dismal Science. Oxford: Oxford University Press, 2000, pp. 61-91. “Invention and Rebellion: Why do Innovations Occur at all? An Evolutionary approach.” in Elise Brezis and Peter Temin, eds., Minorities and Economic Growth. Amsterdam: Elsevier Publishers, 1999, pp. 179-203. “Induced Technical Innovation and Medical History: an Evolutionary Approach,” Journal of Evolutionary Economics Vol. 8 (1998), pp. 119-137. “The Second Industrial Revolution, 1870-1914.” in Valerio Castronovo, ed., Storia dell’economia Mondiale. Rome: Laterza publishing, forthcoming 1999. “Why Was There More Work for Mother? Technological Change and the Household, 1880-1930.” Journal of Economic History, Vol. 60, No. 1 (March 2000), pp. 1-40. “Knowledge, Technology, and Economic Growth During the Industrial Revolution.” forthcoming in Bart Van Ark and Gerard Kuper, eds., Technology and Productivity Growth.The Hague: Kluwert, 2000. “The Industrial Revolution and the Netherlands: Why did it not happen?” De Economist (Amsterdam), forthcoming 2000. “Famine Disease and Famine Mortality: lessons from the Irish Experience, 1845-1850” Presented to the World Clio Conference, July 10, 1997, revised Aug. 1999, (with CormacÓ Gráda). European Review of Economic History, forthcoming 2003. “Science, Technology, and Knowledge: What Historians can learn from an evolutionary approach.” Max Planck Institute on Evolutionary Economics Working Papers 9803, 1998. “King Kong and Cold Fusion: Counterfactual analysis and the History of Technology” March 1999, rev. version, July. 2000. 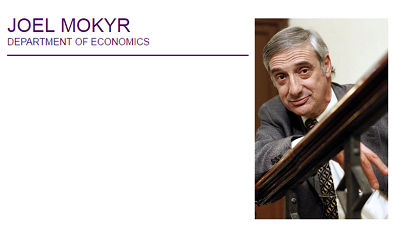 “Editor’s Introduction: The New Economic History and the Industrial Revolution.” In Joel Mokyr, ed., The British Industrial Revolution: an Economic Perspective. Boulder: Westview Press, 2nd ed., 1999, pp. 1-127. “Economic History and the ‘New Economy” Presented to the National Association of Business Economists, Sept. 12 2000. “The Rise and Fall of the Factory System: Technology, firms, and households since the Industrial Revolution”. “Why was the Industrial Revolution a European Phenomenon?” Forthcoming in the Supreme Court Economic Review (University of Chicago Press), 2003. “The Enduring Riddle of The European Miracle: The Enlightenment and the Industrial Revolution”. Presented to the all University of California Conference on Economic Convergence and Divergence in Historical Perspective, Irvine, Nov. 8-10 2002. “Thinking about Technology and Institutions.” Presented to the Macalester College International Roundtable ‘Prometheus’s Bequest: Technology and Change’ October 10-12, 2002. “Useful Knowledge as an Evolving System: the view from Economic history” Presented to the Conference on “The Economy as an Evolving System” in honor of Kenneth J. Arrow, Santa Fe, Nov. 16-18, 2001. “Mercantilism, the Enlightenment, and the Industrial Revolution.” Presented to the Conference on “Eli Heckscher, 1879-1953” Stockholm, May 22-24, 2003. “Long-term Economic Growth and the History of technology.” Draft chapter for Philippe Aghion and Steven Durlauf, eds., Handbook of Economic Growth. “The Contribution of Economic History to the study of Innovation and Technical Change: 1750-1914.” Draft chapter for Bronwyn Hall and Nathan Rosenberg, eds., Handbook of the Economics of Technical Change. “Intellectual Property Rights, the Industrial Revolution, and the Beginnings of Modern Economic Growth” American Economic Review Papers and Proceedings, May 2009, pp. 349-355. “The European Enlightenment, the Industrial Revolution, and Modern Economic Growth” Max Weber Lecture, European University, Florence, 2007. “The Institutional Origins of the Industrial Revolution” in Elhanan Helpman, ed., Institutions and Economic Performance. Harvard University Press, 2008, pp. 64-119.